Register & Login with Facebook! Apply for a Job and Interviewed ! Get Best Job & Request Gift Money ! 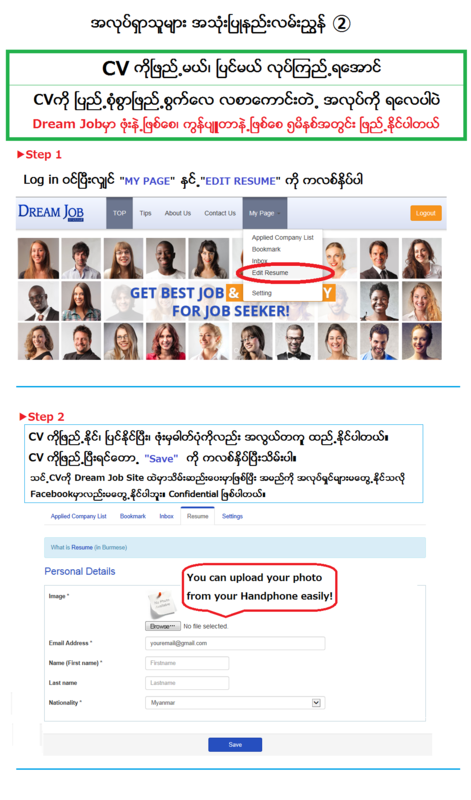 You can use Dream Job Myanmar easily with your Facebook account. An employer used to browse the resumes for hiring requisite staffs. The employer will mail you when they found out your skill and experience are suitable with their requirement. So you should fill your resume to be completed. We inform you too that you’ve received the offer mail form employer (Company). You can see detail view of this job announcement and apply it easily. Type words into the text-box marked 'Keyword' thatwhich describe the kind of job you are looking for, such as a job title, skill or company name. Choose one or more in the box of "Location", “Job Category”, “Job Type”, “Salary”, “Industry”, “Company Type” as you wish. And then, just click the 'Search Job' button. The job list will be appeared which match with your keywords and specified conditions. You can see detail view of each job by clicking on each title of the job list and apply easily by clicking on apply button. Q How do you rank the search results? A Jobs are ranked solely by “Recommended”, “date”, “number of like” or “number of your friend’s like”. Q How do I see only new jobs? A If you want to change this setting for all your searches, you only sort by “latest”. Q Can I save my favourite job? A Yes. When you see job detail or job listing, you can click on Bookmark button and it’ll be automatically saved in your bookmark list. You can see it anytime in your page and apply too. Also, you can use Facebook “Like” and “Share” buttons so that you can share interesting job with your friends in Facebook. Q What is a Job Alert email? A At first, you search the job with some keywords and conditions as you wish. If you would like to receive alert mail when there is a new job posting which match with your search criteria, you can use Job Alert email. Just click on Email Me button and we’ll mail you when a new job was posted daily or weekly as you’ve chosen. Q How do I get offer mail from company? A Make your “Resume” perfect and waiting for offer mail from companies. You can edit your “Resume” to click on the “Edit Resume”. You can check offer mails to click on the “Inbox”. Offer Mail is the welcoming message from the company. They would like you to apply by all means. Please make a contact with them as soon as possible when you receive an offer mail. You can apply for a job online in a few minutes. After you've run a search, click on any job title to view the job details. Click on the “Apply” button to apply for a job. After clicking, you can check “Your Resume Score” and choose edit “Resume” or “Apply”. To Get The Best Job, you had better fill your Resume. Employers can find you easily. If you are selected for on documentary screening, the company may inform you of detail information for interview such as date, time and others. All you need to do is to be well prepared for your job interview. Additionally, you are able to check your recruitment status to click on the “Applied Company List”. When you are employed, Request for Employed Gift Money to us, Dream Job Myanmar! Congratulations, you have got a job. When you pass applicant screening and interview, then access to Dream Job Myanmar after before you checked your first working day. Please full fill the form on your Dream Job Myanmar page and request Employed Gift Money. We Dream Job Myanmar present Employed Gift Money! We transfer Employed Gift Money to your bank account after confirmed your continuous 30 days work attendances.